The full-size plans in the list below can be opened as PDF files, and then saved onto your computer hard disk for review and later printing. Some plans may require adaptation to conform to the current rules – please check out the notes! As there are a large number of people selling these plans on the internet, and the originating magazines are largely defunct, it seems likely that the copyright has lapsed and passed into the public domain. If you know differently, please contact the Webmaster. We provide these plans for personal and educational purposes only and they must NOT be sold on for profit! Also note: Any full-bodied “Class 1” plan can be very easily adapted to make a BCD profile class model by tracing the fuselage outline onto a balsa/plywood sandwich…doh, yes it’s obvious I suppose! 508 Supermarine BCD Semi-profile on plan, easily adapted to profile 33″ Early 1950s UK Heavyweight prototype carrier attack plane (developed into the Scimitar) Ducted Fan .25 or .40 OR profile with .25 or .40 glow in the nose Plan intended for F/F mini-ducted fan. Would need adaptation to C/L but included as it’s a nice change with a V tail! Firefly Fairey Either Either (Full-bodied on plan, easily adaptable to profile) 35″ WW2 British naval torpedo fighter .40 Drawn with an antique “closed loop” tube control system. Just substitute a 3-line bellcrank! Harrier BAeS BCD Profile 30″ Classic UK VTOL fighter .15 or .40 Ducted fan Enlarged 140% from an RTP plan, with vectoring option. MO-1 Martin Class 1 Full 25″ See description for BCD version above .40 An full-on speed model with a loiter & spot landing capability! Northrop F5 Northrop Either Either (Full-bodied on plan, easily adaptable to profile) 38″ 1950-80s US Navy “Aggressor” jet fighter, capable of carrier operation but never actually did. .40 (in the nose) Reduced from 60″ stunt version. Would need 3-line control installed. CLICK HERE for pix of naval activity! Phantom F4 Douglas BCD Profile 36″ 60s-90s Classic Jet Fighter-Bomber .19-.40 Good to try as a first Ducted Fan model! Mine will have a Kress RK740…hold on tight! Skypirate XTD2D1 Douglas Class 1 Full 48″ US Experimental long-range torpedo bomber up to .61 MAN plan with instructions – a really different model! Skyray Douglas Either Either (Full-bodied on plan, easily adaptable to profile) .40 1950s US Navy jet carrier-based delta-winged interceptor .40 for Ducted fan or same in the nose for a profile version Berkeley kit plan beautifully redrawn. If you fancy a challenge, go for the ducted fan, otherwise a glow in the nose would work. Needs 3-line control substituting for Stanzel monoline! 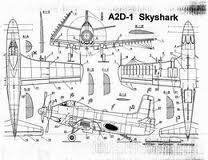 Skyshark Douglas BCD Profile 34″ Late WW2 development of the Skyraider but superseded by jets .40 I’ve finally got my hands on the Sterling kit – just need to scan the plan! Stuka Ju87C Junkers BCD Profile 44″ The JU87C was designed for operation from the Luftwaffe’s unused aircraft carrier ‘Graf Zeppelin’ .40 A bit of a monster as it stands (meant for stunt) but shrunk to 38″ with throttle, would be a nice change!